Investigations of human settlements at a regional scale are of great significance for reconstructing formation processes in prehistoric societies. Such studies allow conclusions about the exploitation of the natural environment as well as the exploration of the degree and the modes of economic and social differentiation and specialisation within the societies studied. Furthermore, they permit qualified estimations of population sizes. When the opportunity arose in 2002 to start a Bosnian-German excavation project, the Late Neolithic settlement of the Visoko Basin was chosen as the object of study. Since then the Bosnian-Herzegovinan National Museum Sarajevo (Zemaljski Muzej), the Roman Germanic Commission in Frankfurt/Main and the Institute of Prehistoric and Protohistoric Archaeology of the University of Kiel have been carrying out interdisciplinary researches accompanied by intensive fieldwork. To date, nine survey and excavation campaigns have taken place 1. In this paper we will give a summary of the main results published recently (Kujundžic-Vejzagić et al. 2003, Schulz 2003, Bittmann/ Kučan 2004, Kujundžic-Vejzagić et al. 2004a, Kujundžic-Vejzagić et al. 2004b, Müller et al. 2005, Müller 2006, Kučan et al. 2006; Hofmann et al. 2007, Müller-Scheeßel et al. 2007). The Visoko Basin is particularly suited for investigations of the kind outlined above insofar as firstly the area adequate for settlement and cultivation is clearly confined by mountains. This provides a comparatively secure base for estimations of population size. Secondly, the area is situated on a natural line of communication composed by the valleys of the rivers Neretva and Bosna. During the whole Neolithic the local Impresso-Starčevo, Kakanj and Butmir societies communicated and maintained with differing intensity exchange connections along this route to the contemporaneous Starčevo, Vinča and Sopot groups in Northern Bosnia and Slavonia as well as to the Impresso, Danilo and Hvar-Lisičići groups in Herzegovina and Dalmatia. Thirdly, because of its size the settlement mound of Okolište comes into question as the central settlement within the Visoko Basin. Therefore, the surveys and excavations concentrated on this site. The Visoko Basin is situated 40 km northwest of Sarajevo. It has a size of 110 sq. km and represents a typical landscape of the “Polje”-type (fig. 1). The basin is crossed by the river Bosna and is 400–410 m above sea level. It is formed by Pleistocene river terraces and Para brown soils. The basin is encircled by Miocene mountains of up to 1000 m height. Its Middle Neolithic occupation is represented by the Kakanj group, and the Late Neolithic occupation by the Butmir group 2. Their typological ceramic sequence and the absolute chronology of this period is basically known thanks to the Bosnian-American excavations at the sites Obre I and II situated 10 km farther to the north (Benac 1973a; Benac 1973b; Gimbutas 1974; Sterud/Sterud 1974). Within the Visoko Basin and its lateral valleys about 15 Middle and Late Neolithic sites are known by surveys and earlier excavations (Perić 1995). The settlement mound of Okolište is located on a Pleistocene river terrace in the northern part of the Visoko Basin. Surveys at several Butmir sites like Obre, Donje Moštre, Zagrebnice and Butmir have shown that Okolište is by far the largest site in the Visoko Basin as well as among the whole of the Butmir group. The settlement measures approximately 7.5 ha, the thickness of the settlement strata amounts to up to 3 m. Other Butmir sites typically do not exceed a size of 3.5 ha. These differences in size seem to indicate a hierarchical settlement system in the Visoko Basin of the Late Neolithic and probably also hint at the development towards a more complex society. At the beginning of the field work in Okolište, a drilling transect and a geomagnetic survey were carried out (Hofmann et al 2007, 53–63). The southern part of the settlement is overbuilt by the village Radinovići. 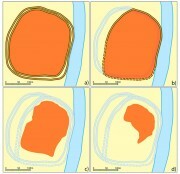 The drillings showed that the thickness of the cultural layer varies between 1 and 3 m.
The results of the geomagnetic and topographic surveys show a rectangular settlement area measuring approximately 330 by 270 m enclosed by an elaborate system of up to four parallel ditches (fig. 2, 3). In the northwestern part of the site this fortification is divided into two strands, indicating considerable changes of the settlement size over time. Inside the enclosure are numerous northeast–southwest oriented houses, arranged in lines. They seem to be concentrated especially in the Northeast of the area, whereas farther in the South and West only isolated houses or smaller groups of them are visible. Until the end of the year 2007 eight areas with a size of 1260 sq. m have been excavated in Okolište, situated within the enclosure as well as in the area of the fortification (fig. 3). The selection of the excavation areas was based on the results of the geomagnetic survey. However, the excavations allow a more precise interpretation of the geomagnetic plan. The choice of the investigated areas originally rested on the assumption that the geomagnetic plan shows contemporaneous features 3. Thus it seemed possible to compare clearly divided coexistent households in regard to social differentiation and craft specialisation. Because the typological development of material culture as well as the absolute chronology of the Central Bosnian Neolithic is already known, whereas systematically uncovered settlement structures are still relatively rare in southeastern Europe, uncovering large areas was given priority in Okolište. Interestingly, it turned out that the features visible in the geomagnetic plan are by no means all contemporaneous (cp. the following chapters). Rather, due to changes of the settlement size houses from different phases lie close to the surface of the settlement mound. This fact permits the investigation of the diachronic development of the settlement pattern and the material culture. The archaeological fieldwork in the Visoko Basin is combined with an extensive programme of investigations of the natural environment and the economic fundamentals of life in Neolithic time. Besides the analyses of the animal bones and the carbonized plant remains there are pedological and palynological investigations in the surrounding of the site Okolište and the Visoko Basin (Kučan et al. 2006; Bittmann/Wolters 2007; Kučan 2007). The fortification system of the settlement was excavated in three areas in the northern part as well as in one area on the eastern slope to a cut-off meander of the Bosna (excavation areas 2, 5, 6 and 7) (fig. 3). According to the results from area 2 it seems that at least two ditches existed at the same time, 3.5 and 4.5 m wide and around 1.3 m deep (Hofmann et al 2007, 69–73). At the inner side of the fortification a rampart and a palisade were uncovered. Based on stratigraphical observations and a series of radiocarbon dates it is assumed that the fortification was constructed around 5200/5100 B.C. during the early phase of the settlement. Until 5000/4900 B.C. the ditch-system was filled in and renewed at least twice. The last renewal took place around 4900 B.C. After that, a gradual filling of the ditches can be observed. Consequently, the fortification system was only used for a relatively short period of time and had been given up long before the end of the settlement around 4500 B.C. From the typological point of view the ceramics from the different phases of the fortification in Okolište represent late Kakanj- to Butmir II-material. However, the Butmir II-material is exclusively connected to the phase of the gradual filling of the ditches. During the campaign of the year 2006 area 5 situated a little farther to the West, where the two strands of the fortification cross each other, was excavated. One of the most important observations of this excavation is that the external strand is definitely older than the inner one. Thus, it can be stated that around 5000 B.C., already in a relative early phase, the settlement was reduced in size: from 7.5 to approximately 5.6 ha. Except for several burials of children in Obre II (Benac 1973a, 72–82), human remains were unknown in the context of Butmir-sites. Hence, the discovery of human bones in the filling of one of the ditches in Okolište was exceedingly surprising. The first human remains of one individual were found in area 2 in layers of the youngest phase of the external ditch, dated to the period between 5000 and 4900 B.C. by radiocarbon analysis. Also solely associated with the latest phase of the ditch-system, human remains were excavated in area 5 situated 15 m to the West. Within a distance of three meters two nearly complete skeletons were found lying in unusual positions (crouching and facing down) (fig. 4). In addition, a great number of disarticulated bones were scattered along the whole length of area 5, mixed with settlement rubbish like ceramics and animal bones. The distribution over several excavation areas suggests that a longer section of the ditch once contained human remains. Unfortunately, this hypothesis was not confirmable in area 6 located a further 30 m to the West because due to differing geological circumstances the conditions for the preservation of bones were very poor there. The anthropological investigations have shown that the human remains represent at least 14 individuals. As far as determinable, the gender ratio is balanced and all age groups are represented; only subadult individuals are largely missing. Two of the highly fragmented skulls show perimortal fracture patterns as typically induced by blunt impact. However, these fractures could have also been inflicted after death. Context and anthropological analyses of the found remains allow different interpretations 4. Their appearance only in the youngest ditch suggests that the bones were all deposited during a relatively short time span around 4900 BC. On the other hand, their different states of disarticulation, and the stratigraphic succession in which some of them were laid down makes it plausible that they were not buried or deposited in one single event. Considering this, the most likely explanations seem to be that these individuals fell victim to violent events, famine or epidemics; in contrast, the deposition of the remains as part of complex burial rituals appears rather unlikely. Within the enclosure the upper layers of three areas where excavated (Hofmann et al. 2007, 74–98). In the largest one, area 3 close to the centre of the settlement, the geomagnetic map shows three parallel structures directed northeast–southwest, measuring approximately 10 m each (fig. 3). These structures turned out to be the remainder of three burnt down houses from the “classical Butmir” period (fig. 5). The rectangular, most eastern house is preserved best; the rubble revealed floors, hearths and inner subdivisions. Also in area 3, beside and underneath these burnt down houses, remains of further, unburnt houses were discovered (fig. 6). These remains in the form of horizontal, rectangular clay deposits had not appeared on the geomagnetic map. Both burnt and unburnt houses had been part of regular rows of parallel houses, exept for the older buildings 14 and 15(fig. 7). That burnt and unburnt houses existed side by side is to be explained by the fact that the same location was used for at least two generations of houses. The houses 8, 10 and 13 must have been already completely destroyed when the other, aforementioned houses burnt down; the remains of house 6, in contrast, were partially still standing and consequently were burnt as well. Following these results, it can be deduced that the area was gradually abandoned, and that the density of buildings there once was much higher, higher even than the density the geomagnetic map suggest for the northeastern part of Okolište. For house 1 – the best-preserved among the three burnt ones – a ground plan could be reconstructed (fig. 8). It was probably divided into 3 rooms; with 4 by 10 m its dimensions conform to the general standard of the houses found in Okolište. Their construction resembles the houses found in Obre II (cp. Benac 1973a, 30–37), yet they tend to measure about 1m less in width, leading to only 30 sqm of floor space, compared to the average of 50 sqm found in Obre II. In excavation areas 1 and 4, in the northeast of the site, similar regular building patterns were observed. However, the buildings from the upper layers here belong to the late Butmir period (Butmir III). This corresponds to the fact that anthropogenic remains have accumulated here for a longer period of time, thus raising the terrain by 0.5 m. Therefore, another substantial reduction of the settlement’s size from 5.6 to 1.2 ha is assumed for the beginning of period Butmir III. Furthermore, the excavations in area 4 have shown that here the building density is higher than was visible on the geomagnetic map. In general, a ratio between 1.2 : 1 and 1.4 : 1 of built to unbuilt space is deducible within the excavated areas which comes close to the maximum of the building density of settlement mounds in Southeast Europe (Chapman 1989). To understand the organisation of daily life and the degree of specialisation of the households within Okolište’s community, the distribution of different categories of finds was analyzed (Hofmann et al. 2007, 131–143). Within house 1 the distribution of fitting ceramic sherds and the functional classification of reconstructable vessels allows the identification of three activity areas: the northeastern room served for cooking, the central room for storage and the southwestern room for food consumption. Repeated occurrences of loom weights indicate that the northeastern parts of the houses were also used for weaving. Contrary to that, the majority of stone tools was usually found in the alleys between the houses. In several areas large accumulations of silex flakes as well as cores were observed (fig. 9). The fact that the highest concentration of them was found within the southwestern part of house 6 can be explained by the use of the partly ruined house as a silex production area. Summarizing the distributions of the several stone tool categories it is possible to distinguish areas for the production of flint tools on the one hand and areas for the use of other stone tools on the other hand, which were situated very close to each other (fig. 10). Specialisation of households in clearly delimited activity areas is not evident, though. 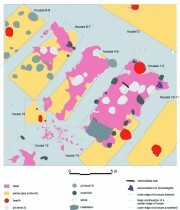 The results of the excavations and the geomagnetic survey allow the estimation of the number of houses and of the population size of Okolište (Müller 2006; Hofmann et al. 2007, 195–200). According to this approximation, around 200 houses existed at the same time in the earlier phase of the settlement. With the assumption that one household consisted of five individuals the number of inhabitants can be estimated at approximately 1000. Presuming the same density of buildings for the other Late Neolithic sites of the Visoko Basin, roughly 3500 individuals lived here which corresponds to a population density of 32 inhabitants per sq. km. Based on estimations of nutrition requirements, each person needs 0.3 ha of arable land for subsistence, plus one cattle, which in turn requires 10 ha of land for pasturing. Consequently, the calculated population would have required 360 sqkm of land; but the Visoko Basin offers a mere 110 sqkm. We thus assume that the population used the uninhabited mountain regions bordering the basin as pastures. According to the first results of the palaeobotanical and palaeozoological investigations food production in the Late Neolithic Visoko Basin and its surrounding area was based on a combination of agriculture and animal husbandry (Benecke 2007; Kučan 2007); hunting was of less importance. Among the domestic animals, cattle dominated with 88 percent in terms of number of bones. This corresponds well to results of Obre where cattle grew in importance compared to sheep at the beginning of the Late Neolithic (Bőkőnyi 1974). Agriculture in Okolište was based on grain cultivation dominated by emmer and einkorn. Less important were barley, millet and naked wheat; there is evidence for the cultivation of several pulses such as lentil and broad bean. The diet was completed by collected fruit, including hazelnuts, wild wine and juniper. In connection with the project, a pollen profile was analyzed from the locality Seoce Jezero situated 7 km North of Okolište (Kučan et al. 2006; Wolters/Bittmann 2007). Unfortunately, it does not reach back to Neolithic time; it does, however, provide important information on the vegetation history of the Central Balkan region from the Bronze Age until today. As shown above, the size of the site Okolište decreased step by step over time. Thus, the settlement’s size was reduced from 7.5 ha around 5200 B.C. to 1.2 ha at around 4500 B.C. (fig. 11). This change correlates with the development of the settlement pattern in the Visoko Basin and its surrounding (fig. 12): in the late Kakanj period the settlements in the Visoko basin numbered about six. In the early Butmir time the number decreased to four which seems to imply a concentration of people in fewer settlements. This situation appears to have been stable until 4500 B.C., even though the number of inhabitants of the largest site Okolište already started to decrease soon after the concentration process. At the end of the Butmir period, another significant change of the settlement pattern can be observed: long inhabited sites such as Okolište or Obre II were abandoned and numerous new settlements were founded at the periphery of the Visoko Basin. The results of the investigations in the Visoko Basin already show that during the course of the Neolithic a development towards more complex settlement structures, probably coupled with the establishment of a hierarchical settlement system, took place. This change could have had its roots in functional and social differentiation of the Butmir society. Within this settlement system the site of Okolište obviously played an outstanding role. Besides it extraordinary size and the high number of inhabitants, it is the high building density and the extensive fortification system that set it apart and particularly point towards a central role. With great certainty, the existence of comparable fortifications at other sites can be excluded. The foundation of the large settlement of Okolište was accompanied with the abandonment of other settlements which indicates a process of concentration. Similar processes at the beginning of the Late Neolithic were observed in other regions of Southeastern Europe, for example in the Tisza region (Link 2006, 59–62). It is not yet clear on which central functions the formation of a large settlement like Okolište was based. At the moment, neither any craft specialisation at local or regional level, neither an extraordinary role within the communication and exchange systems, nor any ritual functions can be held responsible. However, it is certain that the disorganization of the settlement system started already soon after its constitution. Presumably, the fieldwork in the Visoko Basin will be completed in 2009. Still missing are smaller excavations in several contemporaneous sites in the surrounding of Okolište in order to get comparative data. In preparation of this step, surveys at several sites were realized in the spring of the year 2008. Currently, the interpretation of the excavation results, the typochronological studies of the find material and scientific analyses are in process. For example, a further pollen profile is analyzed which was extracted in Prokoško Jezero, situated 35 km to the west of Okolište in the Vranica Mountains. It will hopefully illuminate the use of the mountain regions for animal husbandry in prehistoric times. In the final stage of the project it should be possible to formulate a much more precise model of the Late Neolithic settlement processes in Central Bosnia as well as of the cultural, social and economic background of the Neolithic communities involved. Amongst other issues, it is particularly essential to pursuit the question which factors have led to the constitution of the (potentially) hierarchical settlement system within the Visoko Basin as well as which prohibited its continuity over a longer period of time. Benac 1973a: A. Benac, Obre II. A Neolithic Settlement of the Butmir Group at Gornje Polje. Wiss. Mitt. Bosn.-Herzegowin. Landesmus. Sarajevo 3A, 1973, 5–325. Benac 1973b: A. Benac, Obre I. A Neolithic settlement of the Starčevo-Impresso and Kakanj cultures at Raskršće. Wiss. Mitt. Bosn.-Herzegowin. Landesmus. Sarajevo 3, 1973, 337–429. Benac 1979: A. Benac, A. Benac, Prelazna zona. In: Praistorija Jugoslavenskih zemalja 2. Neolitsko doba (Sarajevo 1979) 363–470. Benecke 2007: Archäozoologische Untersuchungen. In: R. Hofmann, Z. Kujundžić-Vejzagić, J. Müller, N. Müller-Scheeßel, K. Rassmann, Prospektion und Ausgrabungen in Okolište (Bosnien-Herzegowina). Siedlungsarchäologische Studien zum zentralbosnischen Spätneolithikum (5200-4500 v. Chr.). Ber. RGK 87, 2006, 159–161. Bittmann/Kučan 2004: F. Bittmann, D. Kučan, Erste archäobotanische Untersuchungen in Okolište 2002. www.jungsteinSITE.de 24.01.2004. Bittmann/Wolters 2007: Pollenanalytische Untersuchungen zur Landschaftsentwicklung im Visokobecken/Bosnien-Herzegowina. In: R. Hofmann, Z. Kujundžić-Vejzagić, J. Müller, N. Müller-Scheeßel, K. Rassmann, Prospektion und Ausgrabungen in Okolište (Bosnien-Herzegowina). Siedlungsarchäologische Studien zum zentralbosnischen Spätneolithikum (5200-4500 v. Chr.). Ber. RGK 87, 2006, 167–174. Bőkőnyi 1974: S. Bökönyi, The vertebrate fauna of the Neolithic settlements at Obre, Bosnia, Yugoslavia. Wiss. Mitt. Bosn.-Herzegowin. Landesmus. 4A, 1974, 55–154. Chapman 1989: J. C. Chapman, The early Balkan village. In: S. Bökönyi (ed. ), Neolithic of Southeastern Europe and its near eastern connections. Int. Conference 1987 Szolnok-Szeget. Varia Arch. Hungarica II (Budapest 1989), 33–53. Gimbutas 1974: M. Gimbutas, Chronology of Obre I and Obre II. Wiss. Mitt. Bosn.-Herzegowin. Landesmus. Sarajevo 4, 1974, 15–36. Hofmann et al. 2007: R. Hofmann, Z. Kujundžić-Vejzagić, J. Müller, N. Müller-Scheeßel, K. Rassmann, Prospektion und Ausgrabungen in Okolište (Bosnien-Herzegowina). Siedlungsarchäologische Studien zum zentralbosnischen Spätneolithikum (5200-4500 v. Chr.). Ber. RGK 87, 2006, 41–212. Kučan 2007: Vorläufiger Bericht über die Untersuchung verkohlter Pflanzenreste der spätneolithischen Siedlung Okolište in Bosnien. In: R. Hofmann, Z. Kujundžić-Vejzagić, J. Müller, N. Müller-Scheeßel, K. Rassmann, Prospektion und Ausgrabungen in Okolište (Bosnien-Herzegowina). Siedlungsarchäologische Studien zum zentralbosnischen Spätneolithikum (5200-4500 v. Chr.). Ber. RGK 87, 2006, 162–166. Kučan et al. 2006: D. Kučan, S. Wolters, F. Bittmann, Prvi izvještaji, istraživanja polenanalitičkog i ugljenisanog makrobotaničkog materijala neolitskog naselja Okolište (centralna Bosna). Godišnjak 33, 2006, 51–70. Kujundžic-Vejzagić et al. 2003: Z. Kujundžić-Vejzagić, J. Müller, K. Rassmann, T. Schüler, Okolište – Grabung und Geomagnetik eines zentralbosnischen Tells aus der ersten Hälfte des 5. vorchristlichen Jahrtausends. www.jungsteinSITE.de 2003. Kujundžic-Vejzagić et al. 2004a: Z. Kujundžić-Vejzagić, J. Müller, K. Rassmann, T. Schüler, Okolište – Grabung und Geomagnetik eines zentralbosnischen Tells aus der ersten Hälfte des 5. vorchristlichen Jahrtausends. In: B. Hänsel (ed. ), Parerga Praehistorica. Jubiläumsschrift zur prähistorischen Archäologie. 15 Jahre UPA. Universitätsforsch. Prähist. Arch. 100 (Bonn 2004) 69–81. Kujundžic-Vejzagić et al. 2004b: Z. Kujundžić-Vejzagić, J. Müller, K. Rassmann, T. Schüler, Okolište – Iskopavanje i geofizicka prospekcija centralnobosanskog telnaselja iz prve polovine petog milenija p.n.e. Godišnjak (Sarajevo) 31, 2004, 13–32. Link 2006: T. Link, Das Ende der neolithischen Tellsiedlungen. Ein kulturgeschichtliches Phänomen des 5. Jahrtausends im Karpatenbecken. Universitätsforsch. Prähist. Arch. 134 (Bonn 2006). Müller 2006: J. Müller, Demographische Variablen des Bosnischen Spätneolithikums-zur Frage der Bevölkerungsrekonstruktion im südosteuropäischen Neolithikum. In: N. Tasić, C. Grazdanov (ed. ), Homage to Milutin Garašanin (Belgrade 2006) 367–378. Müller et al. 2005: J. Müller, K. Rassmann, T. Schüler, Okolište und Obre – geophysikalische Prospektionen auf neolithischen Siedlungshügeln in Zentralbosnien. In: W. de Bruyn (ed. ), Georadar und andere zerstörungsfreie Untersuchungsmethoden von Bodendenkmälern (Symposium Storkow 2004) (Neuenhagen 2005) 201–218. Müller-Scheeßel et al. 2007: Nils Müller-Scheeßel, Jessica Schmitz, Robert Hofmann, Zilka Kujundžić-Vejzagić, Johannes Müller, Knut Rassmann, Die Toten der spätneolithischen Tellsiedlung von Okolište/Bosnien-Herzegowina: Massaker, Seuche oder Bestattungsbrauch? www.jungsteinsite.de 2007. Perić 1995: S. Perić, Butmirska Cultura. Geneza i razvoj. Arh. Inst. Monogr. 29 (Beograd 1995). Rasson 1983: J. A. Rasson, Interaction Spheres as Adaptive Mechanisms. Bosnian-Dalmatian Relations in the Neolithic (Binghamton 1983). Schulz 2007: W. Schulz, Ein Bohrprofil durch den Siedlungshügel – Der Aufbau des oberflächennahen Untergrundes. In: R. Hofmann, Z. Kujundžić-Vejzagić, J. Müller, N. Müller-Scheeßel, K. Rassmann, Prospektion und Ausgrabungen in Okolište (Bosnien-Herzegowina). Siedlungsarchäologische Studien zum zentralbosnischen Spätneolithikum (5200–4500 v. Chr.). Ber. RGK 87, 2007, 53–54. 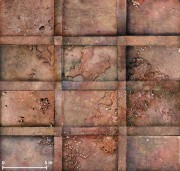 Sterud/Sterud 1974: E. L. Sterud/A.-K. Sterud, A Quantitative Analysis of the Material Remains. Wiss. Mitt. Bosn.-Herzegowin. Landesmus. Sarajewo 4, 1974, 155–279. 1 Aside from the authors the following institutions and scientists are directly involved in the project: German Archaeological Institute: Norbert Benecke (archaeozoology); Lower Saxony Institute for Historical Coastal Research Wilhelmshaven: Felix Bittmann, Steffen Wolters (palynology) and Dušanka Kučan (botanic); University of Kiel, Institute of Prehistoric and Protohistoric Archaeology: Walter Dörfler (palynology), Benjamin Ducke (geophysics), Helmut Kroll (botanic); University of Kiel, Ecology Center: Hans-Rudolf Borck (pedology); University of Kiel, Zoological Institute, Human Biology: Manuela Dittmar and Jessica Schmitz (anthropology); University of Kiel, Institute of Geosciences: Astrid Holzheid and Volker Schenk (mineralogy); Leibnitz Laboratory for Radiometric Dating and Isotope Research Kiel: Pieter M. Grootes (radiometric dating); University of Cologne, Department of Geography: Wilfried Schulz (pedology); Dagmar Opiola (analyzing of daub surfaces); State Office for archaeological heritage of Thuringia Weimar: Tim Schüler (geophysics). Since 2005 the project has been financed by the Deutsche Forschungsgemeinschaft (DFG). 2 For the Neolithic of Central Bosnia different chronological systems have been proposed (Benac 1973a, Benac 1973b, Benac 1979, Gimbutas 1974, Sterud/Sterud 1974, Rasson 1983, Perić 1995). In order to avoid further confusion we use the system of A. Benac (1979) which was improved and combined with absolute datings by M. Gimbutas (1974). 3 The last assumption applies especially to the visible houses burnt down. 4 For a much more detailed description and discussion of the situation cf. Müller-Scheeßel et al. 2007. 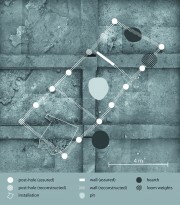 Robert Hofmann, Zilka Kujundžić-Vejzagić, Johannes Müller, Nils Müller-Scheeßel, Knut Rassmann, "Excavations in Okolište and the reconstruction of Late Neolithic settlement processes in the Visoko Basin in Central Bosnia (5200–4500 B.C.)." 11 Apr. 2008. In: Horejs, B. - Pavúk, P. (eds. ): Aegean and Balkan Prehistory. http://www.aegeobalkanprehistory.net/index.php?p=article&id_art=12 (23 Apr. 2019).